If you're wondering how to whiten dentures, you've come to the right place! Your dentures may be a bit old, and have become a bit dull, or the teeth may have become discolored. If so, then here are some tips on whitening dentures. What can you do to brighten things up? When it comes to how to whiten dentures, there are several things you can try. BUT YOU MUST DO THESE THINGS IN THE CORRECT ORDER. Here is MY list, starting with the simplest and MOST IMPORTANT step first! First step - give them a really good scrub with a stiff nail brush and a drop of hand soap and water. It's very important to use a NAILBRUSH that is SMALL with bristles that are STIFF. This works so much better than a toothbrush! ALSO - Do not use normal toothpaste - it's much too abrasive for acrylic dentures, and will scratch and score the surface, taking away the gloss, and leaving them more prone to staining. The simplest, cheapest and best is one drop of a liquid hand soap. Then start to scrub slowly and carefully around the teeth. Don't be afraid to brush firmly, you won't cause any damage as long as you are using plain handwash soap. Firm but slow brushing is the important thing. IMPORTANT TIP - Be sure to hold your denture LOW DOWN in the basin or sink as you scrub. That way, if you should drop them, they won't fall very far! Also, have some water in the basin, too, to cushion the fall. ONLY AFTER you have done the first step above, will your dentures be ready for STEP 2. NEXT . . .
- I RECOMMEND STERADENT. Click on this link to Amazon. Be sure to use THIS good quality product, and make double sure you follow the instructions. Just click on the link above for a GREAT deal at Amazon! Only soak your dentures in a cleaner such as Steradent AFTER you have given them a good scrubbing as outlined above. Otherwise the cleaning solution will not work as well as it could do. Also, only do this overnight soak once a week. If you use a denture cleaning solution every night, the dentures may start to bleach out, making the gum areas look very odd! ONLY AFTER you have done the first TWO steps will your dentures be ready for STEP 3 . . .
Third step - Use an ultrasonic denture cleaner. 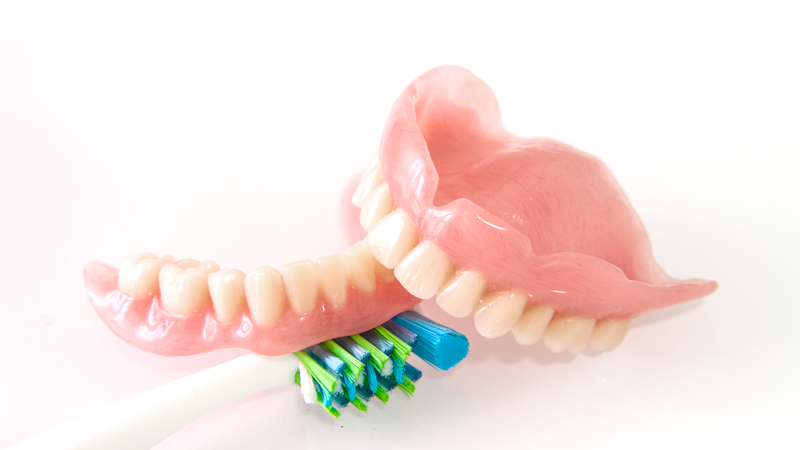 This is the BEST way to whiten dentures - and it's also the most hygienic way of keeping your dentures nice and clean! Ultrasonic denture cleaners are small devices that you can soak your denture in, which also clean by ultrasonics. This gets into the smallest crevices of the denture surface, shifting any bacterial build-up and loosening staining. The BEST ultrasonic cleaner is the iSonic, at Amazon. I like it because it is a nice neat size - (not too big), it is well-built, and it is powerful enough to do a good job. Again, for this to work best, you have to scrub your dentures with a small soft nailbrush beforehand and also afterwards. This will remove any loose microscopic particles that the ultrasonics have lifted from the denture but are still lying on the surface. You can read more about this option at ultrasonic denture cleaners. Finally, THE ARMAGEDDON OPTION! 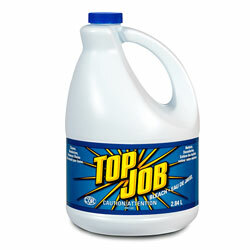 You could use a dilute solution of household bleach. This is the first thing that most folks think about when searching for how to whiten dentures. BUT it's a bit risky, and I wouldn't normally advise it. But I know that some folks out there are going to try this anyway, so I figure I may as well give instructions on how to do it properly and safely. To be honest, if your dentures are still quite stained after you have tried everything I've already recommended, your best bet is to get some new dentures made with whiter teeth. But if you're short of time, and you want to try to whiten the teeth up for a special occasion, here's a run-down of how to whiten dentures for a last-ditch attempt. Yet again, you MUST have tried all the steps above. Those are the safest and most effective. If you have NOT tried ALL the steps above, then even this bleaching option will not work as well as it could do - the bleach will fizzle out on the surface of the deposits left on your denture, rather than whitening the DENTURE surface! If you over-bleach your dentures, the pink part of the acylic will become very pale and look very odd. If you do not rinse your dentures enough after bleaching, YOU MAY BURN YOUR GUMS. For home bleaching of denture teeth, get some normal household bleach, and check the strength. You want LESS THAN 5%. This is extremely important. DO NOT USE ANY BLEACH SOLUTION THAT IS STRONGER THAN 5%. Now take your dentures, and just put them into the cup, into the diluted solution. Check the time, and wait 15 minutes. That's fifteen minutes. After the fifteen minutes is up, hold the cup under the tap and slowly turn the tap on, so that you are slowly adding more water to the cup. Just let it fill up and overflow into the sink. Let the water run like this, washing out the bleach solution, for a full one minute. Now lift your dentures out, pick up your soft nailbrush, and gently scrub all around the dentures under running water for another 2 minutes PER denture. Once you have done that, put your dentures back into a cup or bowl of plain cold water, and let them soak in there for at least one hour. It is vital that you do this plain water soak for at least one hour, to remove the bleach solution that will have soaked into the acrylic of the denture. If you do not soak your dentures in PLAIN water afterwards, your will burn your gums and mouth when you put the dentures back in. There's ONE FINAL trick to get the teeth a little whiter in my guide to how to whiten dentures, but it's a little fiddly. You need to get a small plastic container that is big enough to put one denture in, with the teeth facing down. So your denture is resting on it's teeth. Then you add your bleach solution very carefully, slowly covering the teeth, but NOT the pink acrylic gum area. Only the white acrylic teeth should be covered by the bleach solution. Now wait for 30 minutes. After 30 minutes is up, add some plain water to the container until it's almost full, and then move it into the basin or kitchen sink, and run the cold water tap into the container for 10 minutes to wash out the bleach. Then soak the denture for an hour in plain cold water, before rinsing again under running water. Done! This extra step can be repeated a few times, concentrating ONLY on the white acrylic teeth and avoiding the pink gum areas. Remember, you have to be VERY careful with this procedure. It's essential to rinse the denture several times with plain cold tap water, to make sure you get rid of any traces of bleach afterwards. So that's your guide on how to whiten dentures. I advise you very strongly to use the first three options, in the order I have listed them. The last option, using diluted household bleach, is a last resort, and should only be attempted when nothing else has worked. The real answer, of course, is to go and get some new dentures with whiter teeth!